Chi-Rho in left field, SMNB in Exergue. trophy over shoulder,and dragging captive with left. Minted at officina B in Nicomedia (Izmit, Turkey) between 28 August 388 and 15 May 392 A.D.
Pearce, M.A., "Roman Imperial Coinage", Volume 9 (RIC), Nicomedia, p262, nr 45c. Carson, R.A.G., Hill, P.V., & Kent, J.P.C., "Late Roman Bronze Coinage", Part II, p94, nr. 2408. 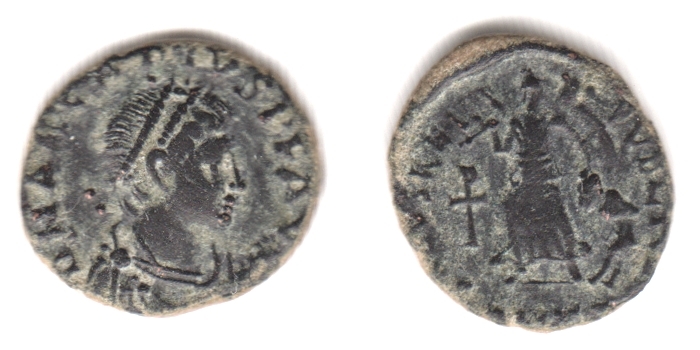 Van Meter, D., "Handbook of Roman Imperial Coins", p326, nr 39.